for each of the 4 suits. ﻿Generally speaking, when the Major Arcanas appear in a spread they refer to the spiritual state or the “big-picture issues” of the querent (the receiver of the tarot reading). The Minor Arcanas, on the other hand, draw our attention to more practical aspects of the querent’s life, and these cards can be examined to obtain realistic advice to the querent’s everyday life. Often, but not always, the Court Cards signify certain characteristics of a person in the querent’s life, or even the querent him/herself. Go back to the Tarot-Yoga page. Book a Tarot-Yoga session by contacting me! Tarot-Yoga is always one-on-one. For the price list please click here. 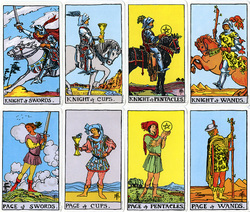 If you are interested in the Tarot consultation only, i.e. without the yoga component, I can do a normal reading for you. In this case, the reading will be done for the purpose of self-exploration rather than fortune-telling. 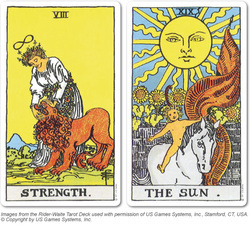 The session will begin with a short, meditative grounding/centering, then move onto the tarot consultation. You will also receive a written report within a week of your session. Please take a look at the bottom part of this page for the fees.